The Sience and Technology Diplomacy Summer School is aimed for professionals of science, technology and foreign affairs, the Summer School will examine the most relevant developments in the field of scientific and technological diplomacy, with special focus on its implications in Europe, the Mediterranean and the role of global cities. The academic training will be complemented with professional development activities, visits and classes outside the classroom, and is an excellent opportunity for all those science professionals interested in scientific policies, the internationalization of the research institutions and the role of science and technology to global governance. During this first edition, we will have the presence of Maurizio Bona, Senior Advisor in matters of relations with parliaments and scientific policy of CERN, Marga Gual, Senior Project Director of the American Association for the Advancement of Science, Luk van Langenhove, coordinator of the program H2020 'European Leadership in Cultural, Science and Innovation Diplomacy (EL-CSID)' and ex-director of UNU-CRIS (United Nations University - Institute of Comparative Regional Integration Studies), Katharina Hone, expert in technological diplomacy at the DiploFoundation of Geneva and Nasser Kamel, Secretary General of the Union for the Mediterranean, among many others. 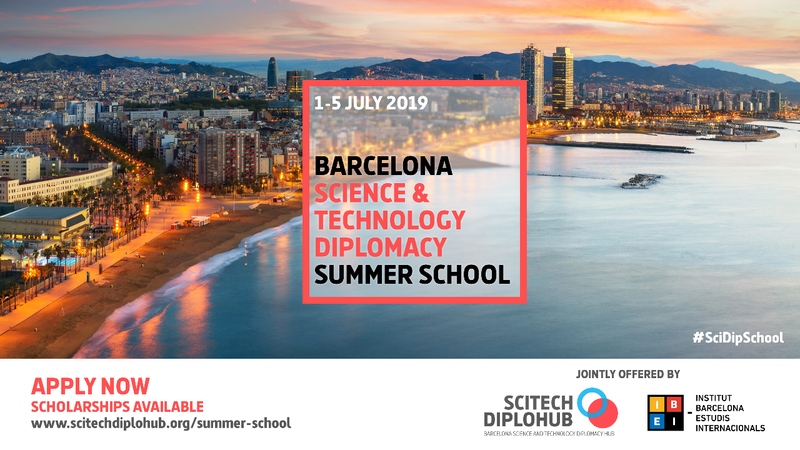 SciTech DiploHub, the Barcelona Science and Technology Diplomacy Hub, is the nonprofit publicprivate partnership in charge of implementing Barcelona’s science diplomacy strategy. Backed by Barcelona’s research centers, universities, non-profits, corporations, startups and public institutions, SciTech DiploHub has the global mandate to make Barcelona an influential global player through science, technology and innovation and its contribution to tackling humanity’s greatest challenges. IBEI is an inter-university institute created in 2004 as a joint effort of all five public universities in the Barcelona metropolitan area and CIDOB (Barcelona Centre for International Affairs) to promote training and research in politics, international relations and global challenges. It has become a consolidated and highly recognized academic and research center at both European and international levels.